The synthetic cork wine bottle stopper is not only used to seal and preserve wine, distilled spirits, but essence and some pharmaceutical as well. 1) Sealing completely and tightly, keeping original flavor of fragrant juice of wine. 2) Never to be broken, size is consistent and unify. 3) Never to be damped and mildewed, innocuity and tastefree, remove the pollution of natural cork to wine flavor. 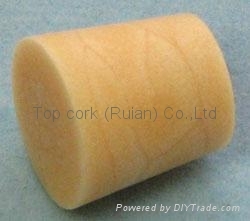 For more information please inquiry staff from Top Cork (Ruian) Co., Ltd.